I was walking down a street in the Chelsea neighborhood of NYC this morning and came across a street closing. 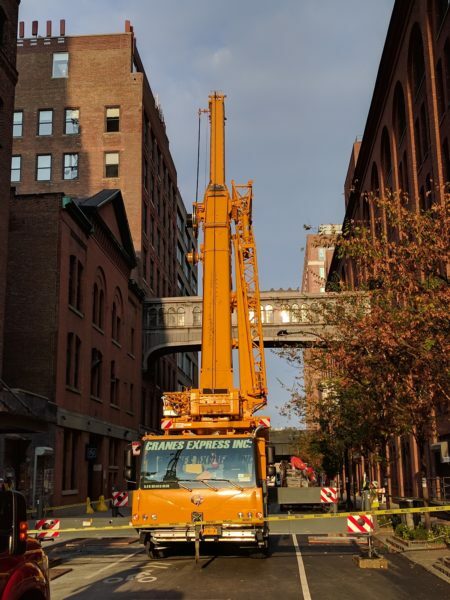 The entire block was closed to cars because that crane was busy lifting heavy material to the upper floors of a building that is being constructed right now. This is a common occurrence in NYC these days. There is construction all over the place. I was in a cab last week and the driver told me that he has never seen more street closings and cranes in NYC than right now. He was complaining about it. But I have a different view. Cranes, street closings, road construction, manhole work, etc are an inconvenience for sure. But they are a sign of vitality, the look of a city evolving and growing in front of our very eyes. Lose the cranes and the construction crews and you will see a city slowly dying. I understand the anti-development, anti-gentrification folks. I appreciate that they are trying to maintain some semblance of history and personal scale. And I appreciate that they are trying to protect people from being forced out of their homes, schools, and neighborhoods by the capitalist desire for more, more, more. But there must be a balance. We cannot decide to stop evolving and growing. We need to find ways to do it gracefully and respectfully. The anti-development forces are doing us all a favor by making sure that happens. But when they dominate the discussion, things grind to a halt and nothing happens. That is not where we want to be. So when I see a street closed by a crane, I celebrate it. It’s progress. No pain, no gain.